Cottage for Two,1 Queen Bed, 1 large bathroom with Clawfoot Bath, Large Deck! Self contained with full kitchen, dining room with Piano, lounge room. Second bedroom & bathroom available for an additional price -$90 per extra adult per night. Otford Cottage DOES NOT CATER FOR CHILDREN under the age of 12. Tariffs include self-service continental breakfast supplies. Otford Cottage bed and breakfast accommodation is situated in the lush green valley of Otford.The houses are Heritage listed, brick semi-detached cottages built in the 1890's for the engineers and surveyors building the new south coast railway line.They have beautiful, original hardwood timber floors and 3 metre high timber ceilings along with a combustion fire place in the lounge room. Very cosy especially in winter. The bed and breakfast is TOTALLY SEPARATE TO THE MAIN RESIDENCE allowing you complete privacy along with SEPARATE ENTRY. Just perfect for couples and singles. NO PETS please. One of the most attractive features of the property is the NORTH facing timber deck (just perfect in winter) overlooking a sandstone paved courtyard with a serene view of the tranquil Otford valley, Hacking River and surrounding forest. The cottage is able to accommodate 4 adults with 2 QS bedrooms & 2 very beautiful and tastefully renovated bathrooms at an EXTRA COST of $90 per person, per night. 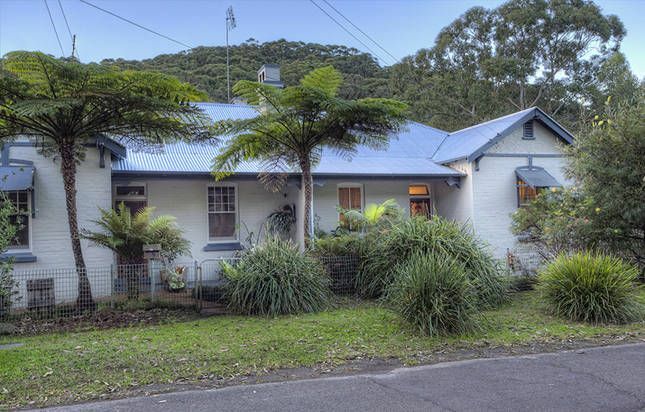 The cottage is self contained with a full kitchen, dining room & lounge room and is within walking distance to Bald Hill and only a few minutes drive from Stanwell Park & Stanwell Tops. We are a 15 minute drive across the Sea Cliff Bridge to Thirroul and 30 minutes north of Wollongong CBD. Tennis court available for use across the road. Tennis rackets & balls provided by cottage. We enjoyed our stay in the historic Otford Railway Cottage. The house was lovelyl and Barbie and Phil have put a lot of effort into making the home beautiful, clean and inviting with lovely linen, furniture and garden. The cottage is on the "doorstep" of the Royal National Park and some amazing bush walks. Scarborough Hotel was only a short drive away. An amazing getaway -yet so close to Sydney! It is always rewarding for us as hosts, to receive feedback from our guests and hear that they enjoy their stay with us. We really appreciate you taking the time to write this review and are very happy to hear that you enjoyed your stay with us at Otford Cottage. It was lovely meeting you all. Thank you. Stayed as a couple expecting our first baby taking advantage of a couple of days away from Sydney and just had the most incredible time. Perfect retreat. Thank you for your lovely comments. We are really happy to hear you enjoyed your stay with us and wish you well for the birth of your baby.